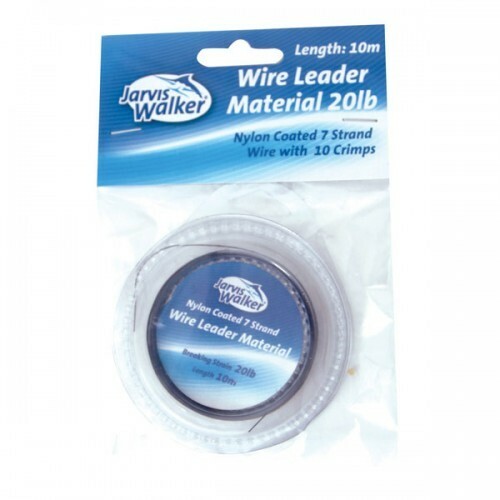 Make your own pre-rigged wire leaders with Jarvis Walker Nylon Coated Wire with Crimp sets. Each packet contains 10m of nylon coated wire ranging in strengths from 20lb to 100lb, and each packet is supplied with suitable sized crimps matched perfectly to the wire thickness. All you have to do is decide what length leader you need, cut the wire to size and start crimping. HOT TIP: Rig a Tsunami Ball Bearing swivel at one end and a Tsunami Ball Bearing Swivel with Coastlock at the other end to make strong re-useable wire traces that allow quick and easy hook and lure changes. FREE Delivery on all Jarvis Walker Shock Leader/Rig Body/Hook Length over £100!! !